If your membership has expired, you will be able to log in but you will not be able to see the Members-Only content available in the links under the Members Area left sidebar. 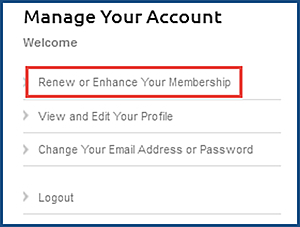 To renew your membership, log in to the Members-Only portal, and in the left sidebar, click the link “Renew or Enhance Your Membership”. You will then be taken to a screen with the renewal options available to you. Much like your initial registration, follow the screen instructions.